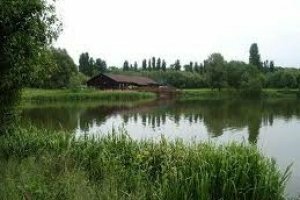 Great Linford Lakes is a very popular fishery, situated by the M1, slightly north of Milton Keynes. The largely carp fishery comprises of nine lakes in total and approx. 2 and a half miles of river. There are also two day ticket carp fishing lakes at Great Linford and general course fishing is also available. A seven acre lake full of features including gravel bars, islands and many overhanging trees and bushes. A 30 acre open (and very windy) gravel pit with a few gravel bars and plateau. The Marle Inn (club-house) and tackle shop overlook the lake. A clear shallow water of 22 acres with widespread weed beds. Carp to just under 40lb with 20+ over 30lb. There are also many large tench and bream, silver fish, pike and perch. A small open water of three acres. Although it was drained and netted in spring 2000 there is still a very high stock of carp. More sheltered than Parc Farm One with variable weed. Large reed beds is one of the dominant features. Popular with the cat fisherman. Large stock of carp – 15lbs to 18lbs with a few over 20lbs. Catfish to over 60lbs and roach, bream, tench and perch. A lake of approximately seven acres with many bays and channels full of reed beds, lilies, overhanging trees and bushes. Carp from 5lb to 25lbs, large bream shoals, tench roach,perch and pike. A seventeen acre lake connected to Rocla. Clear and weedy with a wide variety of depths and a mass of features including reed beds, overhanging trees, lilies, bushes and gravel bars. Carp to 28lbs, tench and bream roach, dace, chub, perch and pike. A thirty acre lake fringed with reeds, trees and bushes. There is also a large island. Carp to 33lbs, plenty of bream, tench and roach and perch and pike. Great Linford Lakes 10 out of 10 based on 1 ratings. 1 user reviews. Hi sorry to be rude but you didn't put the prices down to fish your lakes could I ask how much it is please. Hi I'm looking to fish for around 3 days could you please let me no the prices please.